Have you ever thought about your own perception? How distorted it can be and how easily it can be influenced? How can you or I see things and understand things correctly? and what exactly IS ‘correctly’? Should we strive to represent things accurately? Personally I enjoy having my perception changed -and thinking about it I’m pretty certain most others do too, though only in certain ways. Comedy for instance, works because it leads you into what you think you know, then changes your perception at the end. Drama and Films work the same way, we all like a thriller or a film that has twists and turns. The change in perception is what makes it interesting. In music, I find a piece more of a fascination if it continues to surprise me, even after many years of listening. I have tried to do this in some areas of my own work, seeing things or portraying things in a way which surprises the viewer. 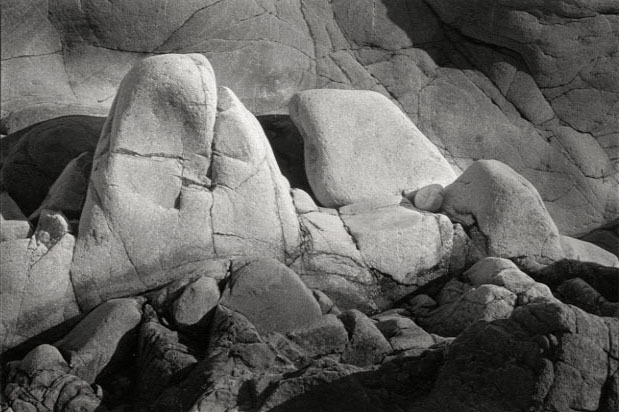 For example, in this simple rock study there is nothing more than a random arrangement of boulders lit by a shaft of light. But if you turn your head to the right so that the left hand side of this image becomes the bottom, you will hopefully see a face. So I would suggest that a literal representation of a subject is not always the best option. it is fine for many subjects, but keep your mind open to the possibility that you can have more impact sometimes if you keep some ambiguity or surprise. Find ways of seeing and representing which lead the viewer a certain way, then twist their perception. It’s fun for the viewer and it’s fun for the photographer. Some of the methods which can bring this about are pretty obvious; scale, angle of view, and putting things in a setting which is out of context. This kind of work demands that the photographer is visually aware for the greater part of each day, as these opportunities don’t crop up very often. Just taking the camera out once a week or less is not going to give a very high hit rate. Be aware, -keep looking, -keep thinking and you will see images. This entry was posted in Uncategorized and tagged angle of view, context, humour, image, looking, perception, photography, scale, Seeing, visual on January 1, 2011 by andrewsandersonphoto.